At last you’re in Piedmont for a wonderful vacation filled with unforgettable baroque architecture, medieval castles, vineyards and delicious foods. What can you bring back to best remember your wonderful time in Piedmont and share with your friends and family? 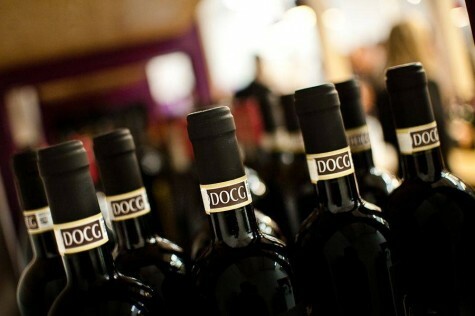 Piedmont produces some of the best wines in the world. However, top wines are often from small family owned wineries with limited production and are hard (and expensive) to find overseas. Whether you visit a winery or an ‘enoteca’ (fine wine shop) in Turin, make sure to get a couple of bottles of your favorite red or white. Barolo and Barbaresco are universally recognized as the best red wines of the Piedmont region. Cortese and Erbaluce di Caluso are my personal favorites among white wines. Before you start your trip, check how many bottles you are allowed to bring back in your home country (and countries where you stop over). As you will have to pack your wine bottles in your suitcase, unless you purchase them at the Duty Free at the airport, ask the seller to pack them properly for you or bring your own wine packing essentials. When packing the wine bottles, I secure the bottles with bubble wrap and plastic bags and cushion the bottles between clothes. Cardboard wine boxes work well too but I am always sure to wrap them again with plastic bags in the event the bottle breaks or leaks (I have been lucky enough that this hasn’t happened). There are also some cool wine packaging options available online. Piedmont is the home of Ferrero (who doesn’t know and love Nutella!). 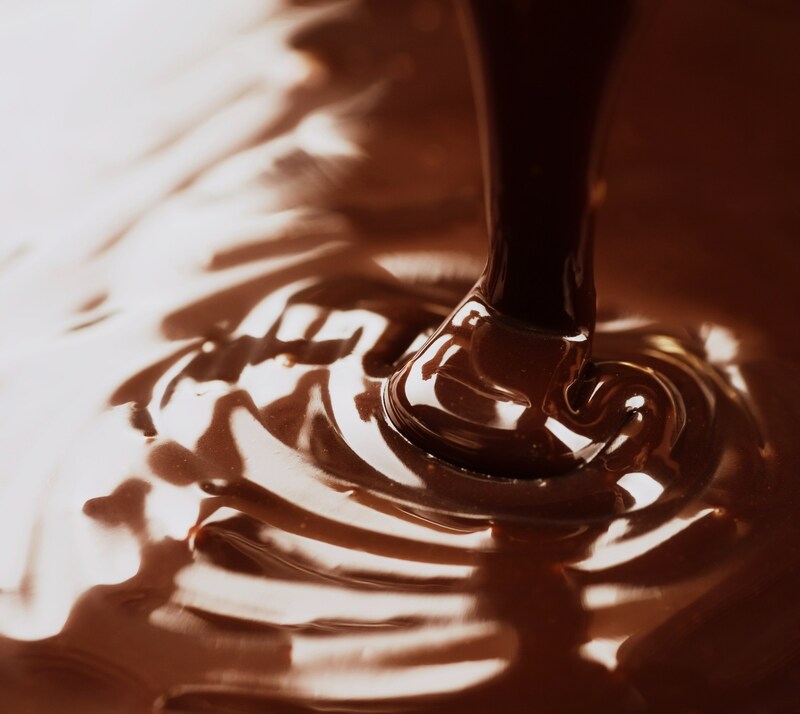 While you can find their products all over the world, most of the finest chocolate produced in the region comes from small artisan chocolate makers. 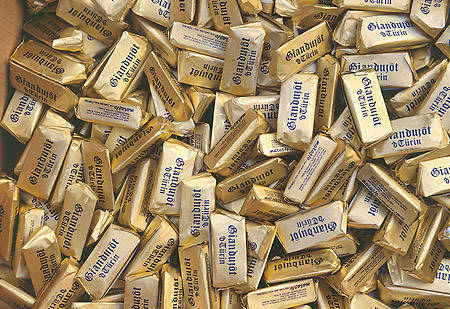 Gianduiotti are the most traditional chocolates of Piedmont. They are small trapeze shape chocolates, individually wrapped in golden tin foil. Their shape was inspired by the hat of Gianduja, the main character of the 16th century popular comedy theatre in Turin. Gianduiotti are made with a mouthwatering blend of cocoa and hazelnuts, which gives the same blissful sensation of a good spoon of Nutella. A perfect gift for chocolate lovers! 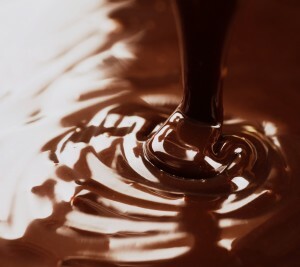 The most popular brands are Caffarel, Streglio, Pernigotti and Peyrano, but there are several patisseries and cioccolaterie (small chocolate shops) which produce their own. 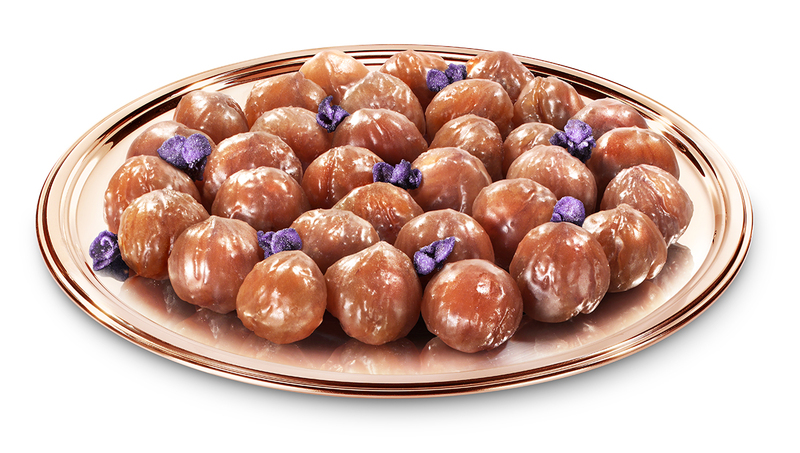 Marron Glacés are candied chestnuts. 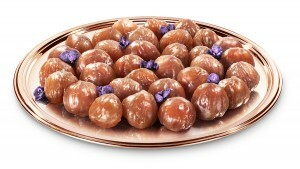 The chestnuts are boiled, delicately peeled and then glazed with a sugar and vanilla syrup. 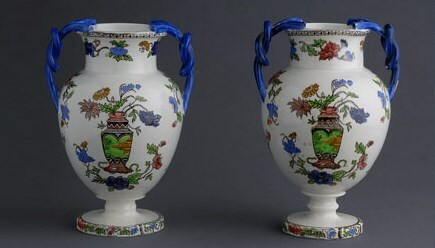 They are often served with candied violets or sugar candies in the shape and flavor of violets. They were invented in the 1600’s either in Southern France or Piedmont. Regardless of the dispute on their origin, marron glacés are unique sweet treats, which I have never been able to find in other countries. They are seasonal: you can find them in patisseries in late fall and winter, already packed in boxes with some violets or, even better, fresh from the counter. Take them in your hand luggage unless they are packed in a box, as they crumble easily. 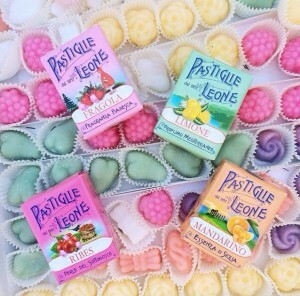 Pastiglie Leone is the most famous original candies of Turin. Tiny pastel colored drops of sugar available in over 40 different flavors. The tin boxes with art nouveau and liberty designs are collectors’ items and are perfect for personalized souvenirs or gifts. Pastiglie Leone can be found in patisseries, some cafes and directly at the Leone’s factory outlet (via Italia, Collegno), which is a great day trip from Turin. In Turin and the rest of Piedmont there are hundreds of small coffee roasters, which source coffee beans from various countries, roast them and blend them. Each blend has a unique flavor. 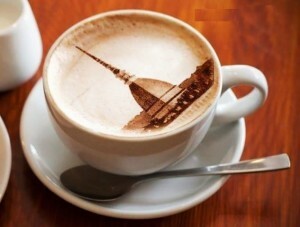 Many coffee roasters have their own coffee bar and many bars and cafés serve and sell their own blend. A bar, which does not have the facilities to produce its own coffee blend, may ask a coffee roaster to make a personalized blend. Whenever you sip that great espresso and just love its rounded taste and inimitable aroma, you may ask the bartender to sell you a few hundred grams of their own coffee blend (either whole bean or ground) to take home. Many bars have their own coffee pods (mostly Nespresso compatible) for sale too. Just ensure they are compatible with your own coffee maker. Coffee is normally ground very finely for use with an espresso maker (either electric or for the stove). If you prefer to use a drip coffee maker or French press, ask for a coarser grind. Turin is the home of two premier league soccer teams: Juventus and Torino. Juventus Football Club (also known simply as ‘Juve’, or ‘La Vecchia Signora’ – the old lady) was founded in 1897 and is one of the most decorated football clubs in Italy and in Europe. The team uniform colors are black and white, in vertical stripes. Torino (also known simply as ‘Toro’, or ‘i Granata’ – the garnet colors) was founded in 1906. Torino was one of the best soccer teams before World War II and the strongest team in Italy in the 1940s. In 1949, that magic team, ‘Il Grande Torino’, disappeared overnight in a tragic airplane crash on the hill of the cathedral of Superga. It took 26 years before Torino FC could win, once more, the Premier League. Today, Torino is always one of the most loved soccer teams in Italy. The team jersey is garnet color. 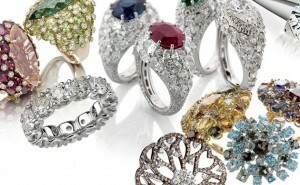 The small town of Valenza, near Alessandria, is the Italian capital of jewelry. The Valenza goldsmith tradition goes way back to the early 19th century and excels for the exclusive designs and the finest quality materials used. 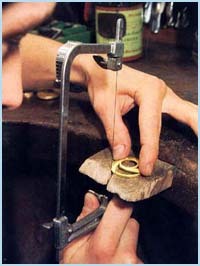 Every piece of jewelry is handmade and unique. Valenza is just over a one hour drive from Turin, near the hills of Monferrato. If you go on a wine tour of Piedmont’s vineyards, you may pass by Valenza and visit some of the finest jewelry shops in the world. Many of the Valenza master goldsmiths jewels can be found for sale in jewelry shops in Turin so have fun shopping! Cashmere comes from Central Asia but Piedmont has some of the finest cashmere manufacturers in the world. Most of the factories are in and around Biella. Wool manufacturing in the Biella area goes back 20 centuries, to Roman times. The first Industrial mill was built in 1817. Centuries of craftsmanship, handed down from generation to generation, have resulted in some of the finest cashmere garments and accessories in the world. Luxury brands such as Ermenegildo Zegna, Loro Piana and Fratelli Cerruti are based in this region. You can buy cashmere products in shops in Turin or take a tour of the mills and their outlets around Biella, maybe on your way to Lake Orta and the Oropa Sanctuary. Mondovì is a beautiful small medieval hill town, about 80Km (50 miles) south of Turin. The ceramics industry started in the early 1800’s and is renowned for its unique decorations featuring colorful roosters, flowers and landscapes. You may find some of the Mondovi ceramics in shops in Turin and some antique plates or vases at Turin’s Balon market in Porta Palazzo, or you can spend a day visiting Mondovi, its Ceramics Museum (Museo della Ceramica Mondovi), some of the factories and their outlets. If you go on vacation in the Alps surrounding Turin, whether hiking in the summer or skiing in winter, check out the local wood carving shops. 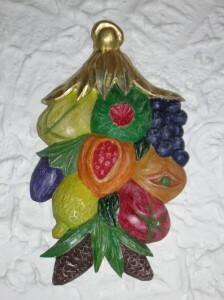 In many alpine towns wood carving is an old and well established tradition continued by several carving schools. The wood products are all handmade and unique. Statuettes, pepper grinders, sugar bowls and relief carved panels to hang on doors and walls, with motives ranging from religious themes to landscapes; from alpine fauna to a cornucopia of colorful fruit (this motif is typical of Bardonecchia). Go beyond the typical souvenirs and buy unique local products to help you remember your trip to Piedmont. 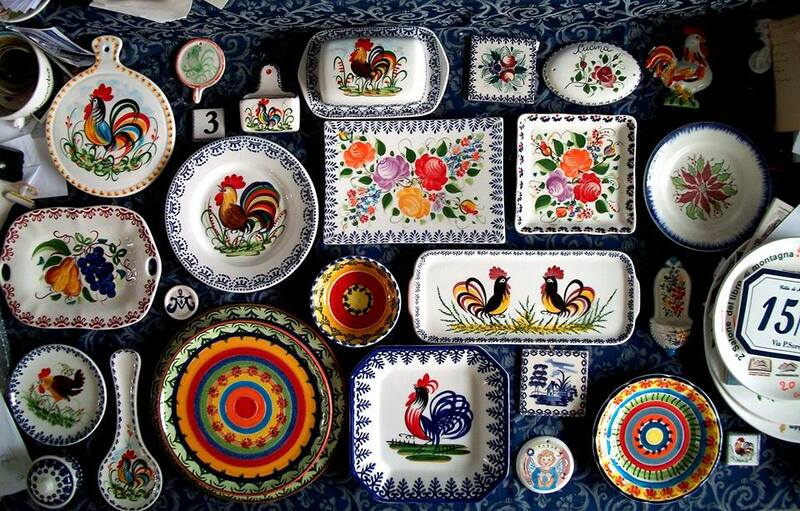 These souvenirs from Piedmont will surely bring back good memories of your trip. So, be sure to put these souvenir and gift ideas on your list the next time you’re shopping in Turin and the rest Piedmont.